Victorian business sentiment has risen despite an easing in residential construction activity expectations during the March 2016 quarter. The latest ANZ/Property Council Survey shows Victorian respondents’ sentiment jumped six points to 140 on the index for the March 2016 quarter. The total index score for Australia rose slightly to 131 from 130 for the March quarter. A score of 100 is considered neutral. 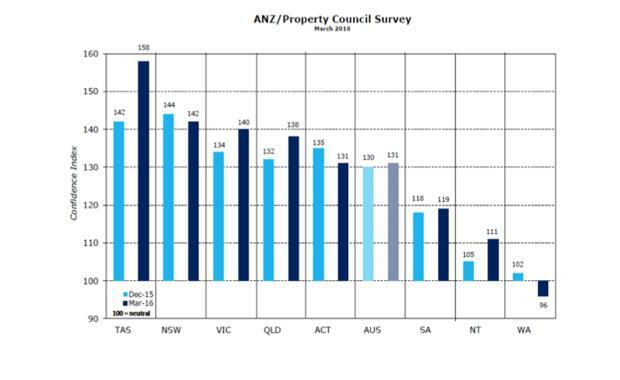 The ANZ/Property Council Survey is the nation’s leading measure of confidence in the property industry and polled over 1,500 respondents for their forward-looking views. Property Council Victorian Executive Director, Jennifer Cunich, said Victoria’s lift in industry sentiment had to be carefully balanced against the easing in residential construction activity expectations. “The Victorian residential property sector has had a very good run with future activity looking positive. However, these figures tell us that the medium term future may not be as bright as the more recent past,” said Ms Cunich. The latest ANZ/Property Council Survey reveals national residential construction activity expectations have fallen 24.8 points over the past twelve months with a 10.9 point decline occurring in the March 2016 quarter. “These shifts in sentiment and outlook need to be carefully considered by both investors and policy makers alike. “Residential construction expectations are steadying after a very strong run. The right policy move for the State Government going forward is one which provides the industry with confidence and consistency. Residential construction activity expectations (Victoria): continued its easing trend with a decline of 12.8 points in the March 2016 quarter.